This spacious ( 2400 square feet ) three-bedroom, two-bath, Waterfront home has a Panoramic view across the main body of the Lake. The home sits so close to the Water you can hear the Fish jump! There are two large Wrap around decks w/adirondack loungers overlooking the lake. Private covered Boat Dock,(very deep Water! )for Swimming and Fishing right off the dock, only Steps! from the house. 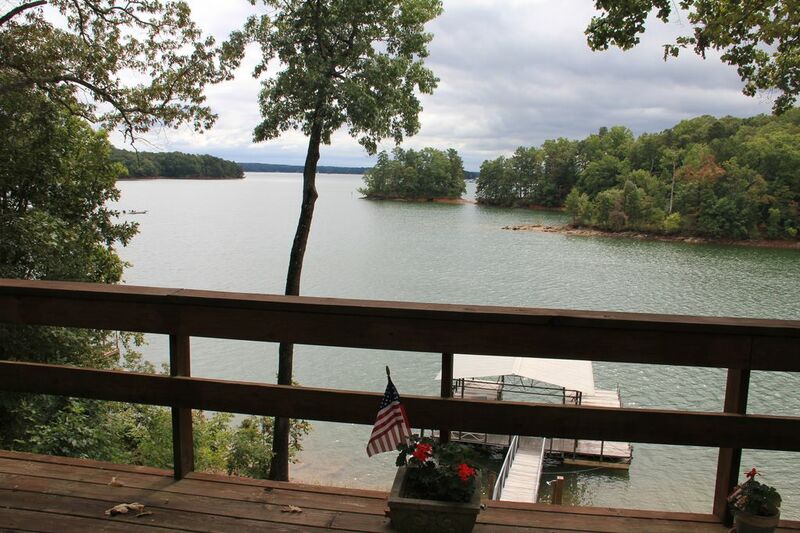 Lake Lanier Water Park just minutes away as well as several Waterfront golf courses. Boat and jet-ski rental, as well as guided fishing tours also available. Sorry, No Smoking! No Pets! Fisherman white washed pine walls, Vaulted ceilings with Exposed beams, Walls of windows! two stone Wood-burning fireplaces make this the perfect getaway. A large Great room with Cathedral ceilings, a stone Woodburning fireplace and Walls of windows across the entire room facing the Lake! that opens to a Wrap around deck that looks out for Miles to an Unobstructed Year Round view of the Lake, adirondack loungers, patio tables, and umbrellas (relax and watch the Sailboats!). Fully-equipped kitchen with Slate flooring and eating area that Views the Lake, includes coffee maker, microwave, toaster oven, blender, etc. Deck also accessable through kitchen. The spacious master bedroom has a Queen size bed, a full tiled bath with double vanity. All linens, soap, etc. are provided. A large living area with Mexican tile floor and stone Woodburning fireplace. Satellite (2) TVs/DVD/VCR, two bedrooms, each with a Queen size bed, two Queen-size sleeper sofas, plus two Rollaway beds, full tiled bath and additional outdoor shower, washer/dryer, and a two-car garage Ten can sleep comfortably. Breathtaking Views! Walls of glass! from this lower level that leads out to another Wrap around deck, an oversized Swing where you can sit and watch the Sunset or Star-gaze. Steps (50 ft) to deep water and covered Dock w/swim-ladder. In the fall and winter you may see a Deer meander by. The home sits among beautiful dogwood and hardwood trees, azalias and rhododendrons. Just minutes from public boat Ramp and Marina, 45 minutes from Atlanta. Sorry, No Pets! No Smoking! 1950's Most Fond Childhood Memories. Summers I spent at the lake water skiing and campfires at night listening to scary stories. My family also enjoyed very much going to the ocean. At low tide, 5 miles out, sandbars would surface. These exposed sandbars were called the SPITS! My mom and dad would go out to these areas and pick up Mussels and Eat right out of the water! NOT today!! When you walked on the sandbars the Mussles would Close Up And Water would Spit out from the Mussles, That is how they came to be named the SPITS! At 6:00 a.m. my dad would have me out on the flats water sking. The water was just like glass it was so smooth At nights I would go giging for flounder, you would use a light and drag your feet on the bottom and the flounder would swim away. My dad took an old broom handle and put a long nail in the end of it, and that was my gear. Million Dollar View! Deep Water (year round!) Close to Water! ( 2 ) car garage NOT AVAILABLE!